Wi-Fi connectivity allows you to control your camera with your compatible Smartphone or Tablet. Frame an image on your smartphone?s LCD, and simply click the camera's shutter you're your device. You can even transfer the images taken directly to your mobile device for quick editing and uploading - sharing has never been easier. With NFC (near field communication) - connectivity has been simplified to one-touch. Simply touch the camera to the compatible NFC enabled device to connect. Make movie magic with Full HD 1920 x 1080 video in cinematic 24p, or capture fast action at incredible 60p and 60i frame-rates. Made even easier with the a5100's 179 point AF (auto focus) system ? tracking moving subjects is not a problem. Selectable in-camera - XAVC S for broadcast quality - high 50Mb/s bitrate, Blu-ray quality - AVCHD or simple and easier upload to the web - MP4 codecs are available. For serious videographers, uncompressed 8bit 4:2:2 clean-screen video files to external recording devices is possible via the HDMI connection. The a5100 features high sensitivity thanks to the newly developed Exmor CMOS sensor and BIONZ X processor. You get stunning detail in in low light from ISO range 100 - 25000. And for an additional burst of light, the a5100 features a pop-up flash. The a5100's tiltable LCD screen flips up 180-degrees to make shooting self-portraits a snap. Include other people, experiment with interesting angles or shoot against famous landmarks. When you press the shutter, the camera does all the work. Perfect when an extra burst of light is needed to get the shot, the built-in Guide Number 6 flash1 combines with high ISO sensitivity to enable shooting in just about any setting. 1. Requires a PlayMemories Mobile app installed on compatible Android or iOS device. 2. 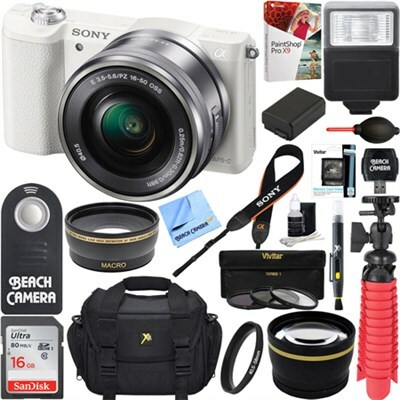 Among interchangeable-lens digital cameras equipped with an APS-C image sensor as of August 25, 2014, based on Sony research. Measured using internal CIPA guideline compliant method with E PZ 16-50mm F3.5-5.6 OSS lens mounted. 3. Records in up to 29 minutes segments. 4. Some functions can only be assigned to certain buttons.